Now when someone special dies, afterwards, what do you normally do? Do you honor their memory by being a good person? Do you become a right scumbag just to prove how good the dead person really was? Or better yet, do you make a series of exploitative films just to cash in on their special name? Poor Bruce Lee. He was such a special guy. 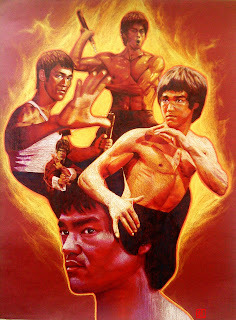 One of the most famous Bruce Lee clones was Bruce Li. At the start of his career Li was originally a Taiwanese martial artist come actor come stuntman. However, under seemingly false pretenses, eventually he was persuaded to don the mantel of Bruce Lee. According to Li, English name, James Ho, his bosses wanted to use his striking resemblance to Lee to honor Lee's good name, and not to cash in on his image (Ha!). To prove this point, in 1978, when Li was asked to play the Bruce Lee character in his incomplete last movie, 'Game of Death', Li turned down the American co-production, presumably because their vision of Bruce's movie was far removed to what Bruce initially intended, plus whatever else he said in the clip provided. Now the second Bruce Lee clone who was successful with his image was a Korean martial artist called Dragon Lee, real name, Moon Kyoung-seok. Born in North Korea in 1958, making him eighteen years younger than Bruce, Dragon made his Bruce Lee debut care of another Bruce Lee clone, Kim Tai-chung, whom also played a Bruce Lee character twice on film (more on that later). When they met, Kim told Dragon that he looked more like Bruce than he did (which is debatable), and so he then headed off to Hong Kong to make... errr... stuff, ha! No. Bruce Le isn't a French version of Bruce Lee. Bruce Le is actually a real actor called Huang Jian Long, or Wong Kin Lung, depending on who you ask. During the late seventies and early eighties, Huang worked for the legendary Shaw Brothers studios; and when he wasn't playing a Bruce, Huang was playing a Superman. Or in western terms, the oriental version of Superman, named Inframan, which is kind of like an old school version of a Power Ranger. Yes. There's that name again. Kim Tai-chung. Now can you remember what two films you might of seen him play a character that resembles Bruce Lee? No. He wasn't in 'Mean Girls'. First he was in the final few scenes of 'Game Of Death'. And then he played the wise Bruce like apparition seen in 'No Retreat, No Surrender'. Oi! Stop laughing. I'm not making this sh*t up! From 1979 to 1980, some chap called Bruce Thai, who's presumably from Thailand (I think), made three pictures where he'd play a wanna be Lee: The Clones of Bruce Lee, Fearless Hyena 3, and Three Avengers. If Bruce Lee ever had a love child with Charles Bronson (heaven forbid), the end result would definitely end up in this guy, Bronson Lee. Thankfully, old furry lip only ever made one movie dressed-up as a Lee. It was called 'Champion', it was made in 1975, and it was cr*p.
If you're ever in the mood for watching a made for television version of Bruce Lee, then you can't get any better than Bruce Lai. Lai, real name, Lee Jae-ryong, is now a prestigious actor on Korean television, playing an esteemed doctor who fixes legs rather than breaking them. Take that, Hai-ya! A bandage. Or maybe not! Now there are a few more Bruce Lee clones I could mention. People like Myron Bruce Lee, Jason Scott Lee, Stan Lee (joke), Brute Lee, plus that chap who played Bruce in that God awful movie, 'The Dragon Lives Again'. But no. I won't. I'd rather you check back here from time to time and see what I have going on in my Hong Kong movie section. Bang! Sadowit!